MIDDLETOWN, Calif. -- An explosive wildfire burned largely unchecked Monday after incinerating homes, apartment blocks and hundreds of other buildings as it raced through rural communities in Northern California's Lake County, leaving at least one person dead and sending thousands fleeing down flame-lined streets. But it's not the only one. A second massive wildfire, less than 200 miles away is blamed for destroying 135 homes as it spread through Amador and Calaveras counties in the Sierra Nevada. That fire was 30 percent contained. The California Department of Forestry and Fire Protection confirmed Sunday one fatality in the Lake County wildfire that raced through dry brush and exploded in size within hours. In addition to the homes, officials also counted two apartment complexes and 10 businesses destroyed by the flames, department spokeswoman Lynn Valentine said. Valentine couldn't provide details on the circumstances of the death. By Monday morning, crews had gained 5 percent containment of the 95-square-mile blaze. In addition, up to 1,000 structures such as barns, sheds and other outbuildings were burned, said Cal Fire spokesman Daniel Berlant. A shift in the weather was expected for the first part of the week as a trough of low pressure approached the West Coast. The National Weather Service said that would mean a cooling trend with increasing winds, higher humidity and showers, then more widespread precipitation Wednesday. The week will end drier and warmer. In Lake County, residents fled from Middletown, dodging smoldering telephone poles, downed power lines and fallen trees as they drove through billowing smoke. Teri Molini said she first heard word of the fire Saturday afternoon and raced out of her house with the family dog, blankets and mementos. Four hours later, she could see the flames from where she sought shelter. "We said, 'OK, this thing's a beast," Molini, 53, said. Whole blocks of houses were burned in parts of the town of more than 1,000 residents that lies about 20 miles north of the famed Napa Valley. On the west side of town, house after house was burned to their foundations, with only charred appliances and twisted metal garage doors still recognizable. Firefighters on Sunday afternoon could be seen driving around flaming utility poles to put out spot fires. Homeowner Justin Galvin, 33, himself a firefighter, stood alone at his house, poking its shin-high, smoking ruins with a piece of scrap metal. "This is my home. Or it was," said Galvin, who spent all night fighting another massive fire in the Sierra Nevada foothills. Valentine said most of the destruction occurred in Middletown and Hidden Valley Lake, as well as among numerous homes along a shuttered state highway. Wind gusts that reached up to 30 mph sent embers raining down on homes and made it hard for firefighters to stop the Lake County blaze from advancing, Berlant said. The fire continued to burn in all directions, triggering the evacuation of a stretch along Highway 281, including Clear Lake Riviera, a town with about 3,000 residents. It was threatening critical communications infrastructure as well as a power plant, Cal Fire said. The fire erupted Saturday afternoon and rapidly chewed through brush and trees parched from four years of drought. Entire towns as well as residents along a 35-mile stretch of State Route 29 were evacuated. Gov. Jerry Brown on Sunday declared a state of emergency to free up resources. Brown had already declared a state of emergency for the separate 111-square-mile wildfire about 70 miles southeast of Sacramento that has turned the grassy, tree-studded Sierra Nevada foothills an eerie white. 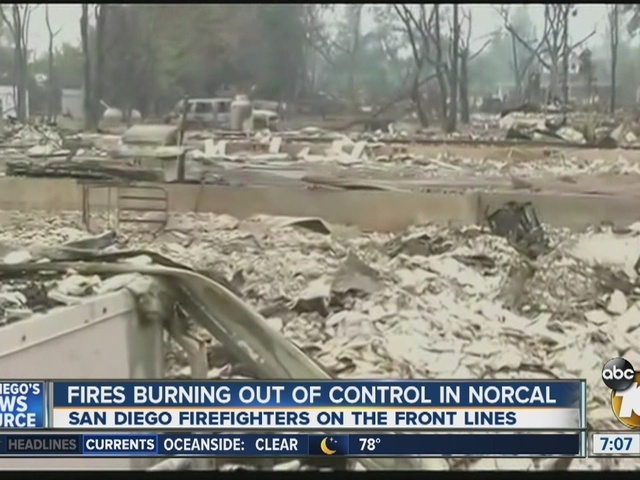 Mark Ghilarducci, director of the Governor's Office of Emergency Services, said this summer's fires are the most volatile he has seen in 30 years of emergency response work. The main cause behind the fast-spreading fires is dry conditions from the drought. "The bushes, the trees have absolutely no moisture in them, and the humidities are so low that we are seeing these 'fire starts' just erupt into conflagrations," Ghilarducci said. Lake County saw devastation in just the last two months. In late July, a wildfire east of Clear Lake destroyed 43 homes as it spread across 109 square miles. As firefighters drew close to surrounding that blaze, another fire erupted several miles from the community of Lower Lake on Aug. 9 and more than doubled in size overnight. 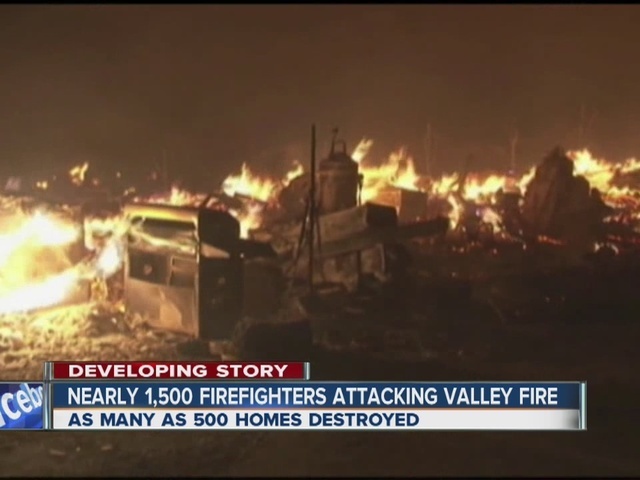 Residents in the area had to evacuate from their homes two times in as many weeks. East of Fresno, the largest wildfire in the state continued to march westward and away from the Sierra's Giant Sequoia trees, fire spokesman Dave Schmitt said. The fire, which was sparked by lightning on July 31, has charred 211 square miles and was 36 percent contained Sunday, the U.S. Forest Service said. Firefighters have maintained a precautionary line around Grant Grove, an ancient grove of Giant Sequoia trees, and set prescribed burns to keep the flames from overrunning it. Some fire came through the area but it hasn't done much harm, fire spokesman Frank Mosbacher told the Fresno Bee. Rodriguez reported from San Francisco. Associated Press photographer Eric Risberg in Middletown and Daisy Nguyen in Los Angeles contributed to this story.